If you or a loved one suffered a catastrophic injury as a result of a slip and fall or a motor vehicle accident, you may have several questions moving forward, including if you have the grounds to file a lawsuit. This blog will answer a few frequently asked questions you might have about catastrophic injuries. For an injury to be considered catastrophic, it must have a profound impact on an individual's life. This includes making it impossible for the individual to work. The victim of a catastrophic injury will often incur several medical bills, which will result in additional stress. In addition to this financial devastation, the victim's quality of life will suffer. Depending on the severity and type of injury, this could mean a person is no longer able to enjoy a typical family vacation or their favorite hobby. In more extreme cases, the person's physical and cognitive limitations will make it difficult for them to care for themselves, which will result in additional medical costs. Many people who are catastrophically injured in a car accident or slip and fall suffer from severe depression and anxiety. What Are the Most Common Catastrophic Injuries? Quadriplegia, paraplegia, and other types of paralysis are also common types of catastrophic injuries. How Will My Attorney Prove Fault or Negligence? To file a lawsuit against an individual or entity, your attorney must prove that the catastrophic injury was caused by negligence or that the other party was at fault. For example, the other driver in a car accident must be found to be at fault for an accident. 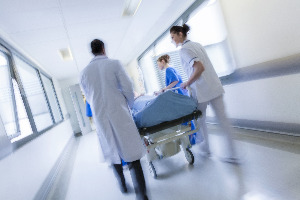 If the catastrophic injury occurred in a hospital, your attorney must show that the doctor or another healthcare professional was negligent and that this negligence led to the injury. Pennsylvania is a no-fault vehicle insurance state. This means that if you are involved in a motor vehicle accident, your insurance provider will cover the cost of lost wages and medical expenses. However, because the injury is catastrophic, your attorney can file a lawsuit against the other driver if they were at fault for the accident. The other driver's insurance company will then pay any compensation awarded. If the injury occurred after a slip and fall, your attorney will need to prove that the property's owner did not provide safe conditions. In most cases, this means that the property owner or employee knew about the unsafe conditions and did not address them, was the cause of the unsafe conditions, or did not notice unsafe conditions that another competent person would have noticed. Your attorney will fully investigate the circumstances surrounding your catastrophic injury to prove fault or negligence. In the case of a car accident, this includes interviewing witnesses, reviewing any videos or photos taken at the scene, securing a police report, and taking additional steps to prove the other driver was responsible for the accident. Lost wages. These are the wages that you lost directly as a result of the accident. This includes what you would have earned if you were not in the hospital or in a rehabilitation center. Lost potential wages. The wages you would have earned in your career can be collected. However, this requires that you hire an expert, such as an economist, to determine what you would have earned during the progression of your career. Medical needs. This includes your past and future medical needs. Once again, you will have an easier time receiving compensation for past medical needs than for your future needs. The testimony of a medical expert is often required. Pain and Suffering. This money is meant to compensate for the impact the accident or fall has had on your quality of life, including any mental and physical pain and anguish you will suffer. Suffering a catastrophic accident can have a profound impact on the victim and their entire family. If you have any other questions, contact the professionals at Clearfield & Associates.